Apple's Siri may soon get more of a human touch as the Cupertino company is investigating the viability of using crowd-sourced information to broaden the virtual assistant's answer database. Currently, Siri relies on data pulled from the Web and other online services, like Yahoo!, WolframAlpha and Bing, to answer user queries. While their databases are extensive, these partner services may not be able to handle nuanced or uncommon questions. 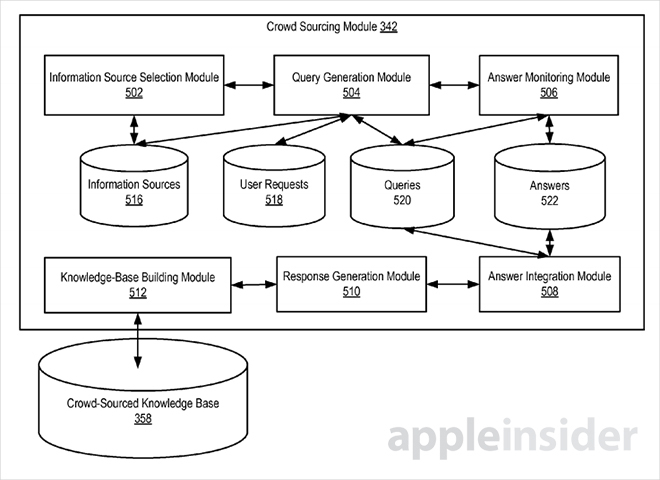 A patent filing published by the U.S. Patent and Trademark Office on Thursday reveals Apple is looking into the viability of crowd sourcing answers for certain questions that Siri fails to answer. Titled "Crowd sourcing information to fulfill user requests," the application is a primer on how the virtual assistant can request, gather and store data from a number of crowd sourcing, or "CS," information services. As explained by the document, the a digital assistant requires a natural language processing system, knowledge base and artificial intelligence to function satisfactorily. Any of these facets can hinder operation and, in some cases, produce unsatisfactory answers. It is in these scenarios that a CS information service can be deployed. For example, the CS module can be invoked as part of response failure mechanism that can be updated over a period of time to remedy a speech recognition problem. More commonly, the CS module can query a CS knowledge base to address questions previously unanswerable in real time. According to the patent language, the external sources of information can include services that compile data from experts, general information sources found on the Web and various question-and-answer forums. In some embodiments, the CS module provides a knowledge base filled with responses to questions that the system previously failed to answer correctly, thus building out an existing response database. Databases can include information from a single CS service, or an aggregate from multiple sources. A variety of knowledge base types are mentioned, such as forums where a question can be posed to the general public. In other cases, specialized sources can be pinged with a question, examples of which include "expert forums, technical support forums, [and] fan-sites for particular subject matter." Interestingly, the invention allows for both automated and manual invocation of the CS feature. For example, if the system detects a failure to respond, it can send the query off to generate answers over an extended period of time. On the other hand, a user can specifically request that a CS knowledge base be tapped for a specific answer. As in existing Web-based CS databases, like Quora or Answers.com, individuals can identify themselves as experts and lend answers to queries posed by the CS module. Question handling may take place through a third party, or by the CS module itself. One embodiment even describes an "answer arena" where players win points or credits for providing correct answers to a user's questions. As the technology deals with rare or personalized queries, users may have to wait some time for the system to return an answer as it collects the appropriate data. In some cases, the length of time could be weeks. When a satisfactory response is found, the digital assistant can relay that information to the user at an appropriate time, such as in between meetings. Finally, feedback can be provided as to whether the response generated from the CS module was correct. If a user was satisfied with the information, it can be stored in the CS knowledge base, to be retrieved when a similar question is asked. If the CS module determines the user is not pleased with the response, it can either stop looking for an answer or escalate the question to another source, such as a human representative. The rest of the filing details backend operations and a run down of virtual assistant technology, including natural speech recognition and reporting. In addition, privacy concerns are addressed regarding uploading of questions to the CS module. 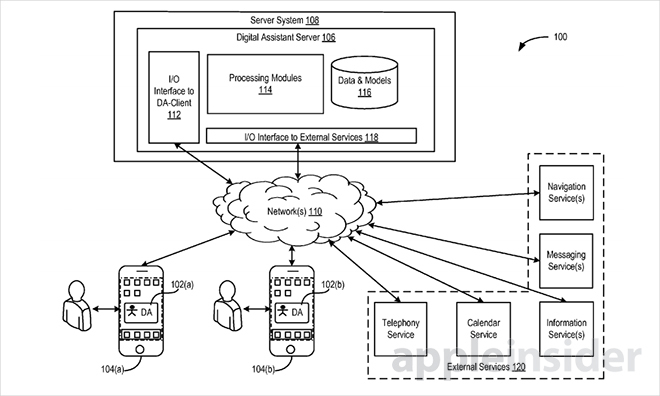 It is unclear if Apple will implement the invention as part of Siri. Since its launch in 2011, each iteration of the virtual assistant has added a greater range of abilities and tie-ins with third-party services, though none have as direct a human element as described in Thursday's filing. 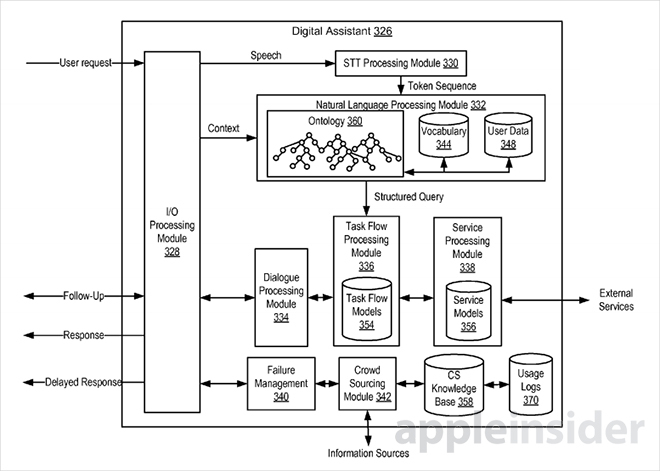 Apple's crowd sourcing patent application was first filed for in March and credits Thomas R. Gruber, Adam J. Cheyer and Donald W. Pitschel as its inventors.